Most business owners are interested in strategies for business growth, as they want to increase their sales turnover and to boost their profitablity. Turnover growth doesn't always result in an increase in profits, but with careful control of your costs it is likely to increase your profits. For the purpose of this article I have put aside constraints such as having enough workers, or being able to source enough raw materials etc. to concentrate purely on the growth strategies - rather than cost saving strategies. Sell more of your existing services or products. Alter or package prices to achieve higher revenue overall. Sell new, or enhanced services or products (diversification). Sell to new customers (recruitment). Adding Support Services - offering additional services to your existing customers e.g. maintenance to support the product that they have purchased. Marketing - advertising or otherwise promoting your products to try and find new audiences, and new customers. Promotions - offering a promotion such as a percentage for free, or a discount of future purchases, to try and incentivise customers to buy more, in order to qualify. New Sales Channels - alternative routes to market e.g. sign up over the internet (if you don't already offer it). Price Increases - increasing prices, even by a small margin, may lead to an overall boost in sales volume. Acquisitions - acquiring another business, or part of another business so that you can increase sales. They may have existing customers, or them may be able to offer you additional products, services or technology that will allow you to increase turnover. Often costs can be saved by leveraging your existing infrastructure to service new customers following an acquisition. Product Development - developing new, or improved products. Establish A Third Party Seller Network - are there third parties that could offer your services to their customers (perhaps in return for some kind of commission). Remove Intermediaries - alternatively, are you able to sell direct to new customers by removing intermediaries? Strategic Partnerships - are their other organisations that you could partner with, so that you can benefit from their customer base or promotional network? Franchising - offering your product or service to franchisees, parties that acquire the right to offer your products or services, and in return pay you some form of margin. Just some ideas, all of which are given to you free of charge to consider or use. 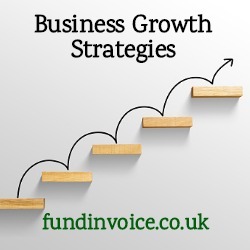 For more help see our Free Guide To Growing Your Business.